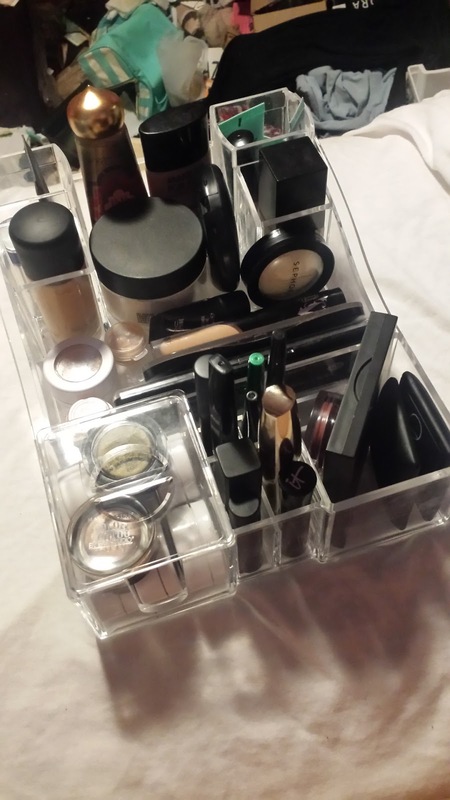 Beauty By Shannon: What's in my every day acrylic organizer? I made two New Years resolutions this year, and one is to overhaul my messy bedroom! And to start that process I'm buying more organizers/containers/shelving to keep all of my stuff organized! I purchased a Acrylic organizer, that hold's anything and everything I could ever need/want for day to day and MORE. I couldn't get a good picture of it, as it's shiny and see through so none of my shots were looking 'swell! But here's a from above shot of the organizer and the stuff I'm keeping inside of it! In the very back two compartments I keep these primers! 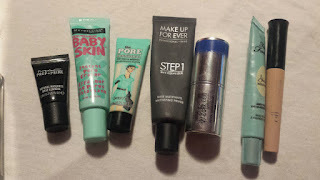 These are my every day primers, or primers i'm testing out! I of course, don't use every one of these every day. I DO switch out. MAC Radiance Yellow - "Radiance boosting primer" I like to use this after my sunblock, it's a lotion consistency, that smooths over the skin easily! Maybelline Baby Skin - "Pore Erasing primer" This is "just" a clear silicone primer. I was given it for christmas, so I'm testing it out right now. Benefit PoreFessional - "Pro Balm" This is a silicone primer that fills in pores, and helps keep my oily skin at bay!! So far I REALLY enjoy this primer!! Make Up Forever Step 1 - "Matiffying primer" I'd have to google it, but I don't FEEL any silicones in this primer. But it's a creamy primer, that you PAT onto the skin to maximize the oil absorbing abilities!! I would recommend this for oily skinned people. MAYBE Combo, but ONLY used on oily areas! It WILL accentuate dry skin. The Estee Edit Pore Vanishing stick - This is a siliconey stick primer. It's clear on my skin tone. 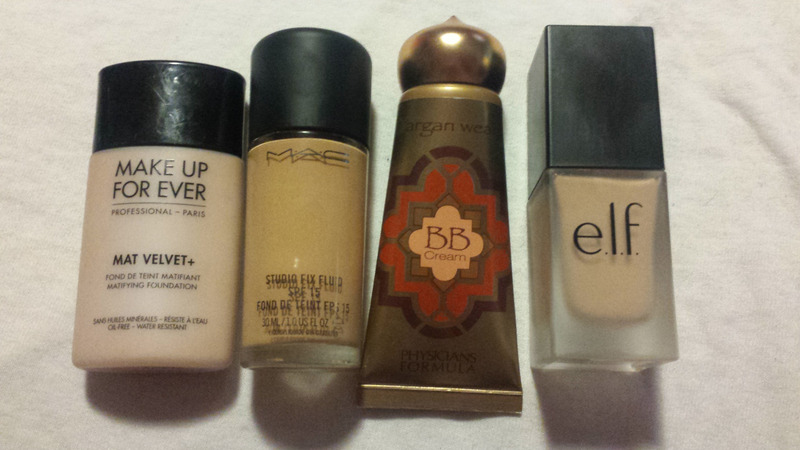 (I say this because I have not seen it applied on lovely dark skin tones!) And I really adore it! I was given a sample of it, and I fell in love. I swipe it onto my forehead, sides of my nose, and inner cheeks, then pat/blend it out with my fingers. It doesn't absorb oil, but it really smooths and preps my skin! Too Faced Shadow Insurance - This is a super lightly peach tinted eye primer. I squeeze out the SMALLEST bit and pat it from lashline to browbone. I have super oily, and severely hooded eyes. 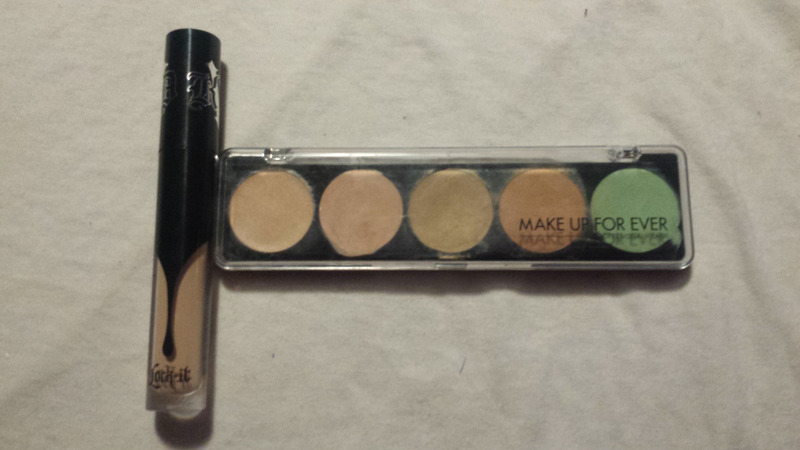 And this is one of two eye primers I'v tried that actually keep my eye shadows from creasing! It dries to a stiff finish. So I like to take a eye shadow/face powder lighter than my skintone and set it so it's easier to blend eye shadow ontop of! ELF Sheer eye primer - This is the second eye primer that i'v found to work on my oily lids! The ONLY reason I don't switch to this eye primer (This is $2, and the Too Faced one is $24) is, I go through about 5 of these a year. Where I'v had the same Too Faced eye primer for over 2 years now. But it's just as good as the Too Faced one!! Make Up Forever Mat Velvet+ #40 - This is a hair too dark for me right now, as it oxidizes a whole shade one my skin. It's also too orangey for my lighter mid winter skin right now. But I like it for mixing! 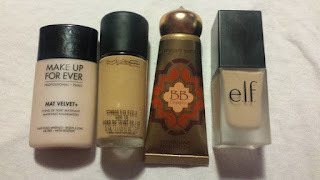 I love the finish of this foundation, so I'm keeping it, to bring out in the warmer months! 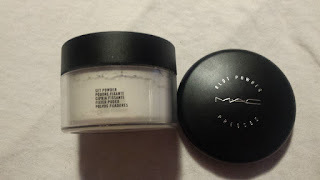 MAC Studio Fix Fluid SPF15 NC20 - This and the ELF foundation are my closest matches to my neck right now. It's a thick foundation, with pretty good coverage. I like to do a dot on each cheek, a dot on my forehead, and half of a dot on my nose and chin, then buff it out. It lasts so well on me, and it's the closest i'v gotten to matching my super prominent yellow undertones! Physicians Formula Argan Wear BB Cream Light/Medium - This is a great FORMULA for Canadian winters, it's pretty dang moisturizing for my oily skin, and keeps my skin soft all day long! It's a touch orange for me, right now. But I just buff down my neck. It doesn't last as long on my face as foundations, but with face primer, and setting powder I can get pretty darn good wear! ELF Flawless Finish Foundation Sand - This is my second best match right now! It's a hair not yellow enough, But It's not noticeable when I wear my hair down. It lasts all day, and is creamy and smooth! Kat Von D Lock it Concealer Creme Light11 - This is a great concealer for quick days! it's super pigmented and blendable on my oily skin. I can use it as a foundation on lazy days as well! I just swipe it onto my cheeks, and dot it under my eyes and BAM good to go! 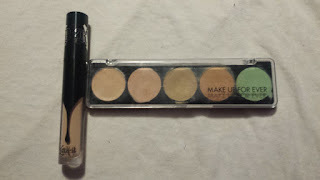 Make Up Forever Concealer/Corrector pallet #1 - I love the formula of these! They're super creamy for a potted concealer. And I love the two correcters! MAC Set Powder - I like to use this under my foundation to help absorb oil, and to set under my eyes! It's not heavy or cakey! 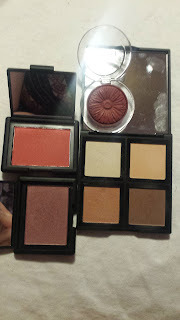 MAC Blot Powder Pressed Medium Dark - Despite this not being dark at ALL, I love this powder!! This is my second compact, and It's just as mattifying and great as the first! Sephora Brand Baked Luminizor 01 Stardust - My holy grail highlighter! This is my second compact of this, as I scraped out the first one. It's a beautiful yellow gold, that looks perfect on my yellow toned skin! Tarte Amazonian Clay Foundation Fair Light Honey - This is one of my favourite foundations!! |It's super thick, opaque, and yellow! I don't have the $51 plus tax to buy it right now. So I'm living out of a sample! Urban Decay All nighter Foundation 2.0 - This is too light for me, but it oxidzes almost a full shade. I'm not a huge fan of how this looks on my skin. It's a bit cakey and patchy? Colourpop Glitter Sheer eye shadow Paisley - This is a sheer yellow pressed glitter! 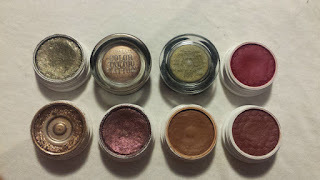 I love this in my inner corners and on my lids! Make Up Forever Artist Eye shadows - I just posted a review of these three shades, so do go check that out! 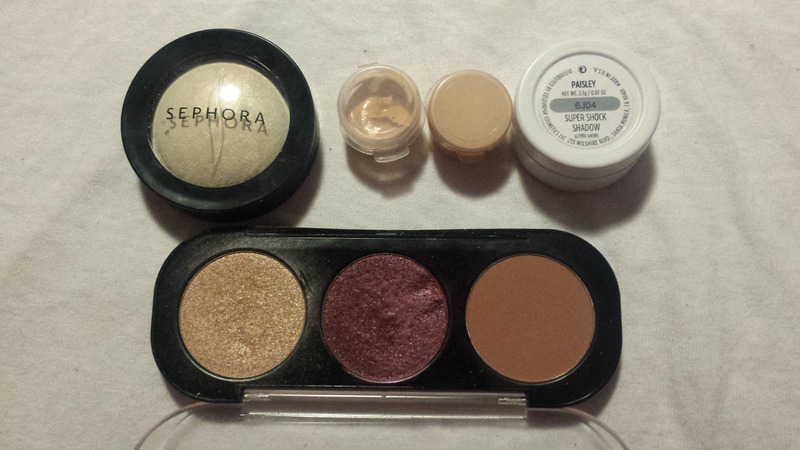 But I use these three as a face pallet, and as eye shadows! IT Cosmetics Super Hero Mascara - This is a great formula and brush! But it dries out quickly for me. L'oreal Voluminous Millions of lashes mascara - This gives me the BEST lashes I'v ever had! MAC Brow Set Brown Ebony - My current favourite brow gel! It's tinted enough to add colour back to my brows, but holds well enough to set them in place! 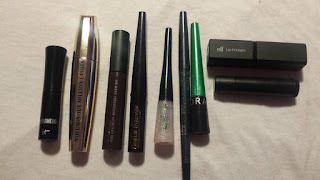 L'oreal Carbon Black liquid liner - My current opened liquid liner. Unknown glitter liner - I have less than a quarter left of this, it's a rainbow glitter in a clear gel. Avon Always on Point Black liner - This is the BEST liner for my waterline! It lasts so long, and isn't painful or hard to apply. Sephora brand Liquid liner Life's a picnic - A green liquid liner with teal sparkles. I like it! ELF Original Lip exfoliator - Self explanatory. LUSH Santa Baby Lip tint - My HOLY GRAIL lipstick EVER! This is everything I'v placed into my Acrylic organizer! 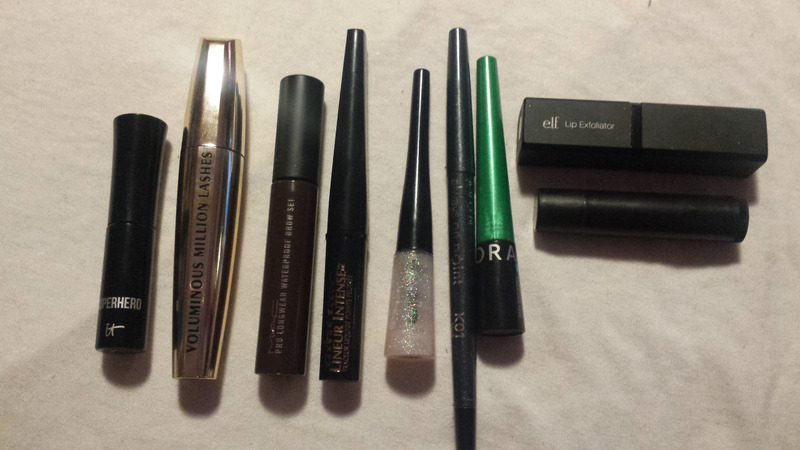 I find I'm not reaching for anything else, or bringing out anything else from my makeup drawer. I'm planning to switch out my foundations/blushes/single shadows with the months/seasons!